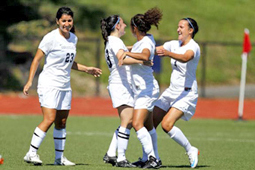 The women’s soccer team is entering post-season play in the prestigious National Collegiate Athletic Association Division III tournament for the second time in Brandeis history. The Judges will host the first two rounds of the tournament on Gordon Field on Saturday and Sunday, Nov. 13 and 14. The team is led on the field by seniors Sofia Vallone of Westport, Conn., and Tiffany Pacheco of Rehoboth, Mass. Vallone led the UAA in overall goals (17), overall points (38) and goals (5) and points in conference games (10). With postseason play still to come, Vallone has tied the Brandeis single-season record for goals and is two points shy of the single-season points record.